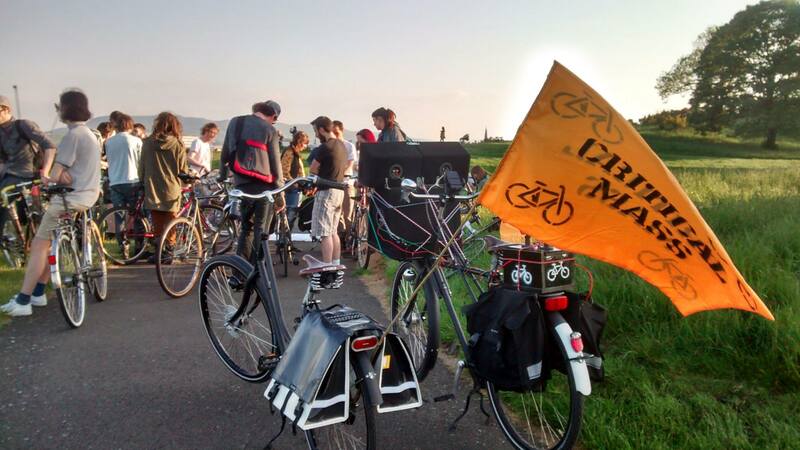 Well, the weather is beginning to look fine and we’ve got so much light in the sky we don’t know what to do with it – I love Critical Mass at this time of year – people are a little more relaxed, the numbers swell, we have more fun!!! 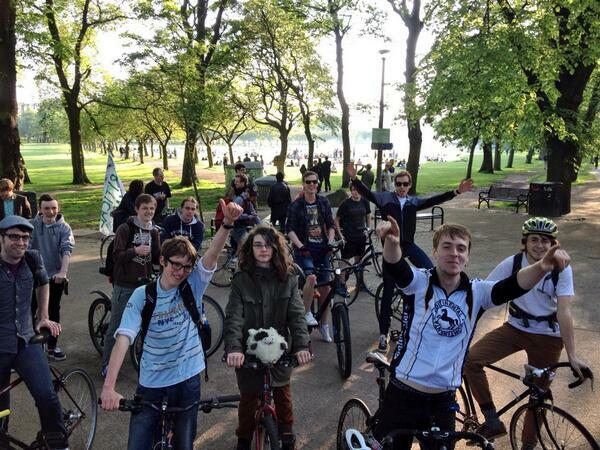 Last month has been a busy one for cycle activists out there. 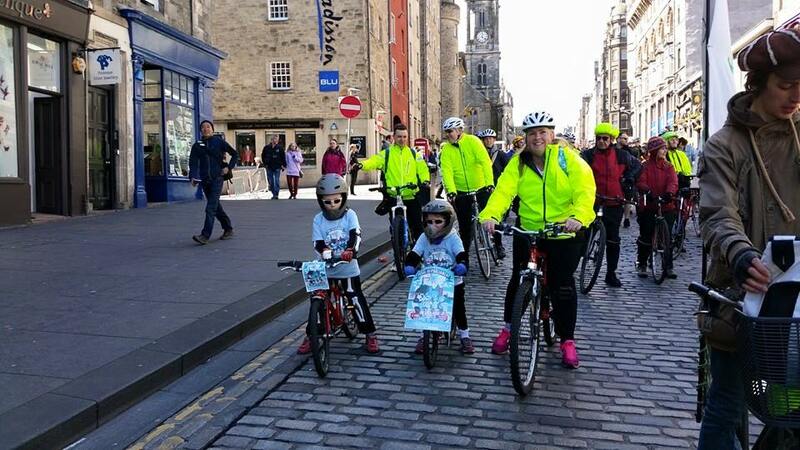 Not only did many of us take to the streets to Pedal on Parliament but many have also been in preparation for the Edinburgh Festival of Cycling, which runs from the 11th to the 21st of June. One not to be missed is the World Naked Bike Ride in Edinburgh on the 13th June, which a number of us Critical Massers have been promoting. These are very exciting times!!! 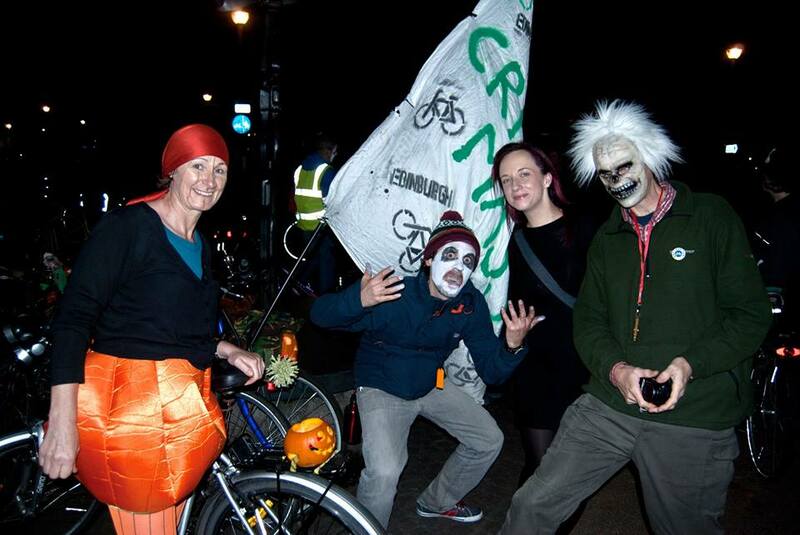 So why not join us for Critical Mass this Friday? First time riders, families, familiar faces – all are very welcome. 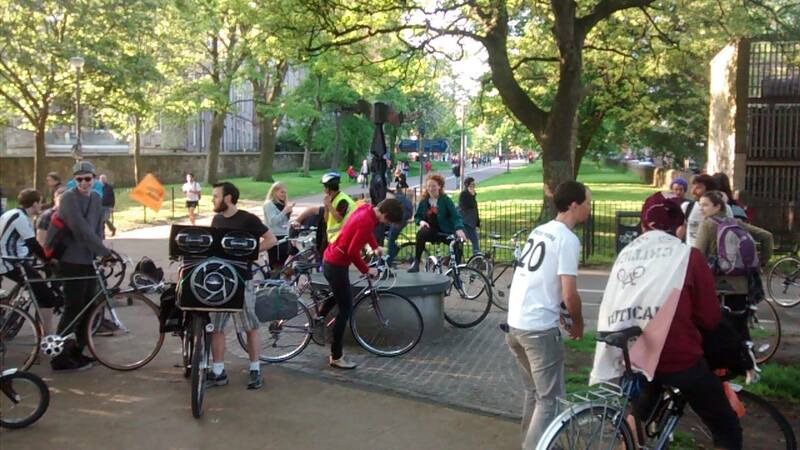 We begin our ride as ever at 5.30pm on the Mound outside the Scottish National Gallery. There we chat, catch up, get to know one other…maybe paint our faces too…all very essential for building a fun-loving community! 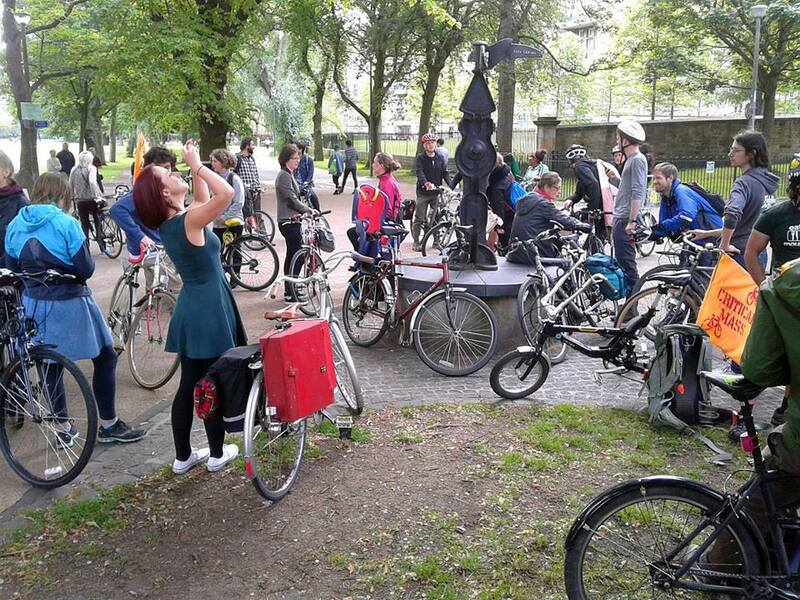 Then we set off at about 6pm to ride around Edinburgh in a peaceful yet assertive way – riding in a mass with good music and illustrating that we too are traffic and celebrating the beauty of one of humankind’s greatest sustainable inventions. 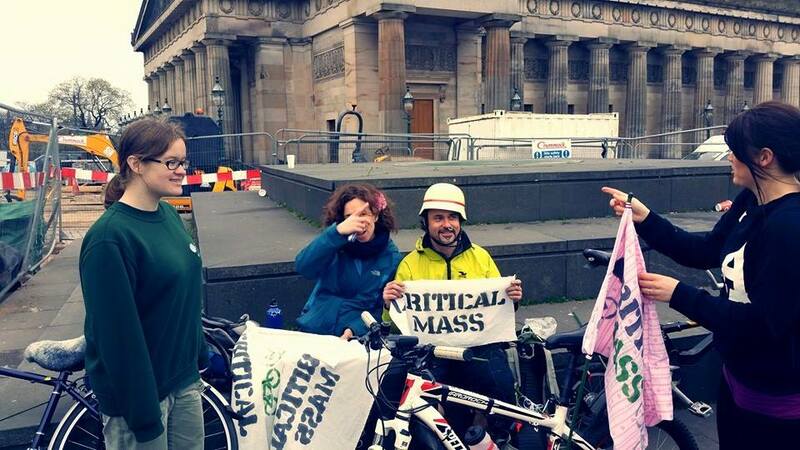 This is a BIG week for Edinburgh Critical Mass. 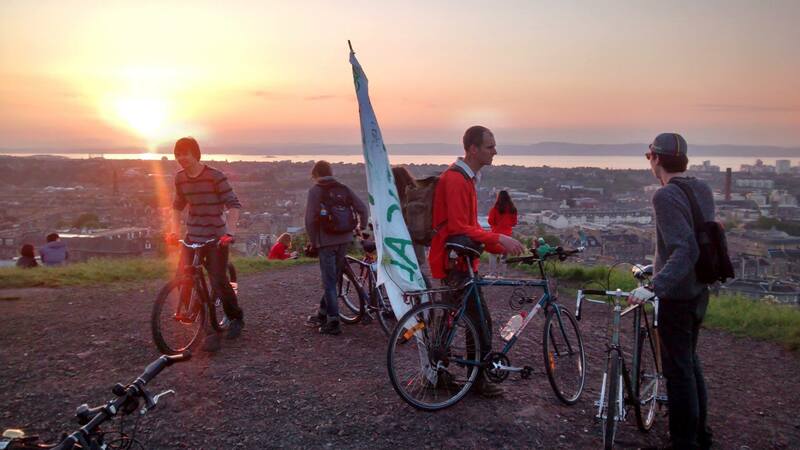 We are meeting on Wednesday at 7pm to make flags for the weekend’s two big Edinburgh City cycling events. 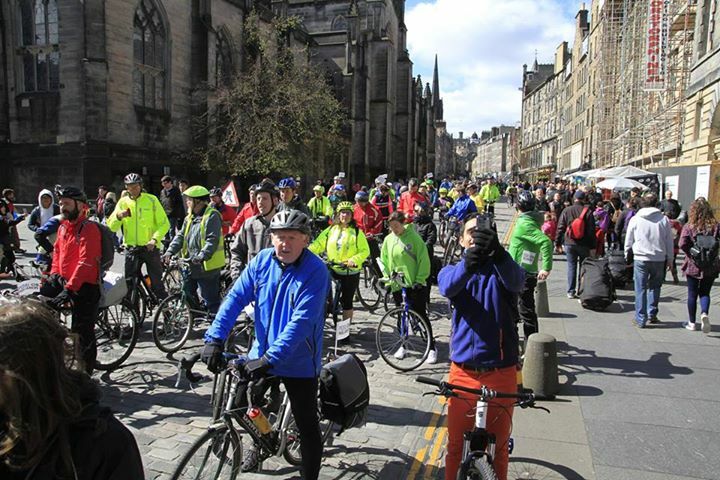 On Friday it is the Critical Mass Edinburgh ride April edition which will be the first ride of the year fully in daylight, so we are hoping for a good turnout and a super-fun ride. We will be face-painting as usual before the ride so come early if you want to be decorated! We will be meeting from 5.30pm at the Scottish National Gallery, The Mound, Edinburgh. 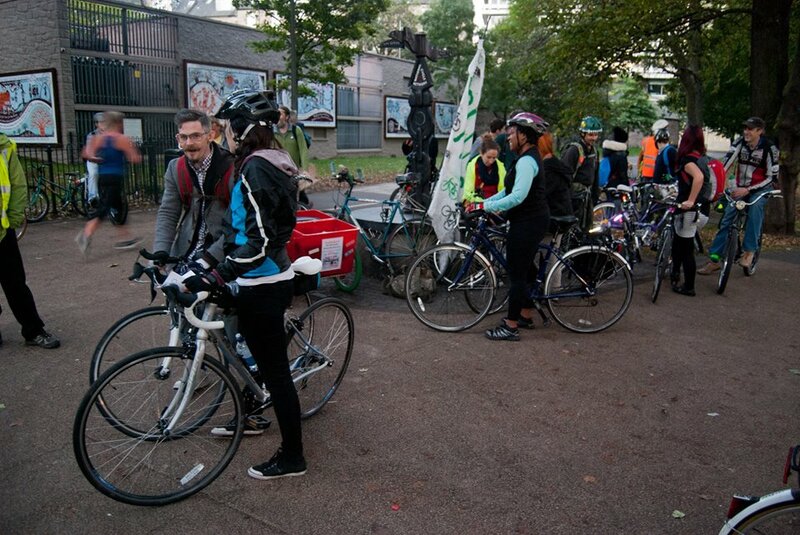 Event details at: https://www.facebook.com/events/458657044293123/ Then we will stop at 7pm at Middle Mile Walk on The Meadows to pick-up the later arrivals. After the ride we will do something social as yet to be decided, possibly watch a movie at ACE http://autonomous.org.uk/or ride to one of Edinburgh’s fine pubs. 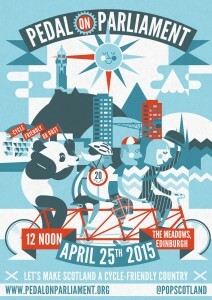 Please come and join us on Friday and Saturday and help us fly the new flags for Critical Mass Edinburgh. 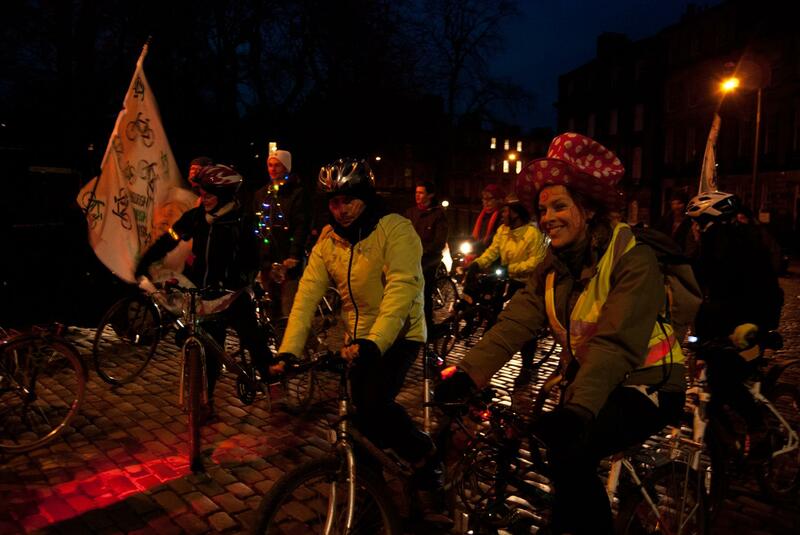 February Critical Mass Edinburgh was blessed with good if cold weather. About thirty people attended which is major advance on our numbers at this time last year. We did some face painting prior to the set-off, and dressed so as to make it really obvious to the people we pass how much we fun we have during the rides once we have created some breathing space for ourselves. 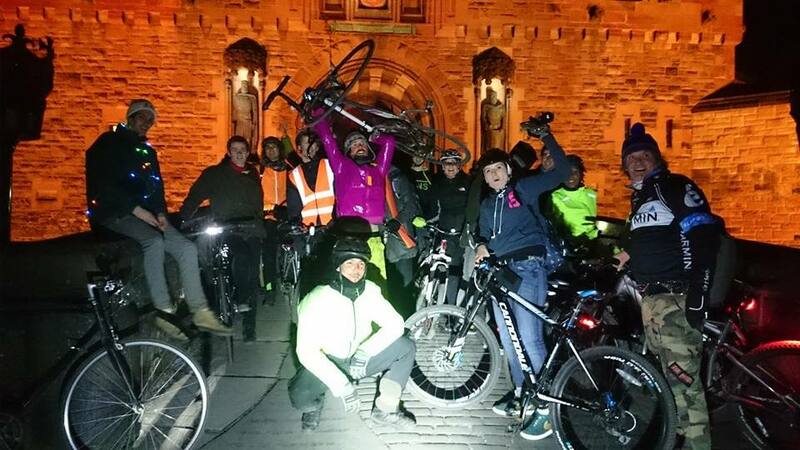 We cycled up the Royal Mile to the castle which made a good chance to stop for photos, after which we descended and sped around to the Meadows for our now routine second meeting point at 7pm, where we picked up a few souls awaiting. After the Mass we pedalled down to ACE in Leith http://autonomous.org.uk/ where we watched the movie The Flying Scotsman, about the controversial Scottish cyclist Graeme Obree http://en.wikipedia.org/wiki/Graeme_Obree The movie was enjoyed by all and contained the message that to promote change for the good, one may well have to do things that society or the establishment (cycling or otherwise) would rather prefer you didn’t and kept quiet! This month quite a few new faces were present, and the Facebook group is about to reach 500 members. Join up at: https://www.facebook.com/groups/173122149399382/ This bodes really well for the Spring and Summer coming month’s rides. The fracking fever is spreading. Today, nearly two thirds of the UK are already covered by fracking rigs. As a consequence, there’s an increase in carbon emissions, destructive weather patterns and release of toxins into our soil and water. The extent of social costs, health deterioration and housing prices in rural areas are becoming more pronounced. 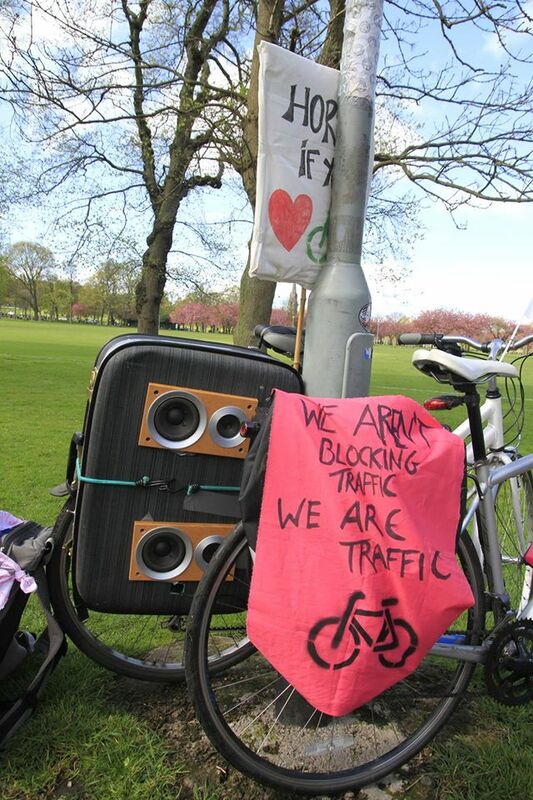 Reclaim the Power and Critical Mass have come together to counteract this injustice, with the most energy saving, pollution reducing, and health boosting mode of transport. Come join us this Sunday for our Fracking Fun Sunday Bike Tour. 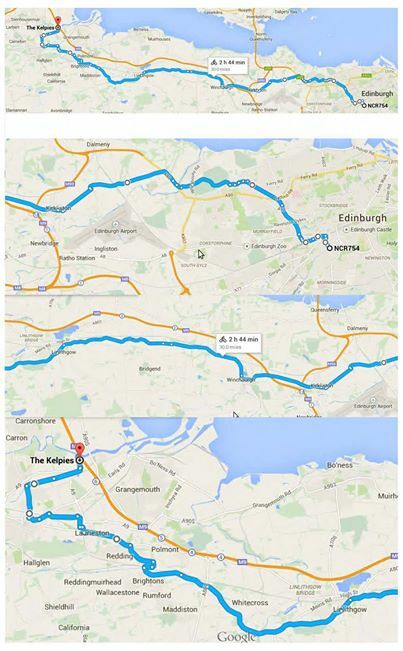 Our journey will begin in the Edinburgh city center and cycle towards The Kelpies (100 feet tall equine sculptures). Once in Falkirk, anti-fracking group, Reclaim the Power Scotland, will take you round the monuments of dirty energy in the area. This will hopefully elucidate how close all this industry is too us, and how many communities are fighting hard against it! There’s also going to be a peaceful rally against fracking in Grangemouth which we will be joining afterwards if energy is left! – Leaving from edinburgh by bike: meet at 9am on Leamington Bridge (over Union Canal), we will then cycle through Queensferry (you can meet us on the way if you know the route). – if you want to take the train: meet at 12h30 at Falkirk Grahamston Station (train leaves from waverley station just after 12), and join for the dirty energy tour and the march! bring warm clothes, yumy food and water, we won’t be cylcing like mad rabbits (but if you want to you can! ), so a speed of 10miles/hour is to be expected, with mainly simply roads! Pdf of the route soon to be shared, and contact reclaimthepowerscotland@riseup.net for any questions! Critical Mass is proud to present a Friday night screening of “The Flying Scotsman“. The screening will take place at the Autonomous Centre of Edinburgh (ACE) this Friday 27th February 2015 at 7.30-8pm (depending on the arrival of the mass) and we welcome you to join us. Cycists – gather – join forces – become one – ride safe – ride with joy. 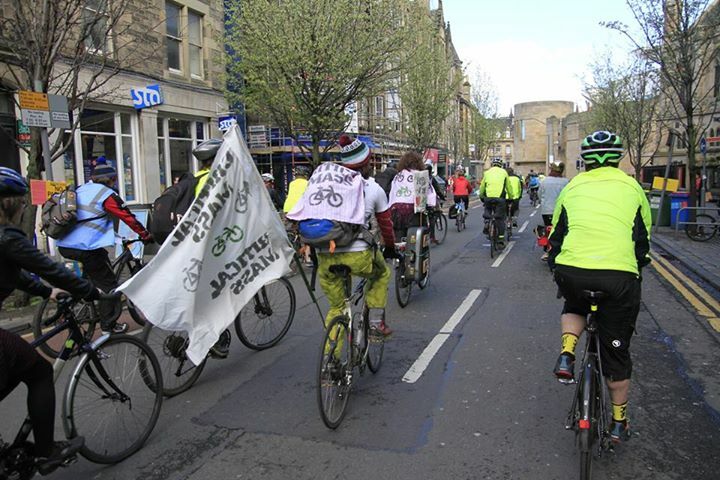 No month would be complete with out a Critical Mass and so this Friday we take to the streets of Edinburgh to celebrate a cyclists life. It’s not always easy out there on the road alone and that is why we like to cycle as a mass, where we have fun and feel safe. Everyone is welcome and we promote a peaceful but assertive ride. Come and find out for yourself what we’re about (FAQs are here). We will meet at 5.30pm outside the Scottish National Gallery on The Mound to leave just after 6pm and for those that miss us at 6pm there will be the usual 2ND MEET POINT AT MEADOWS PARK AT 7PM – bottom of the Quartermile, in the middle of Middle Meadow Walk.